Jim’s wedding band is among few physical objects he carried. Woruldspeda. My husband’s worldly goods—the ones he would want me to save—are easily catalogued: his Les Paul guitar, his photography equipment, the telescopes he used to survey the heavens he knew so well. Still, every drawer I open contains objects which stop me cold in some way—sometimes even when I have opened that drawer many times before. In Jim’s top bureau drawer I found a jumble. I realized only after staring for several beats at the items in front of the drawer that he must have emptied his pockets there just before the last time our friend Bob and I brought him to the Emergency Room. I deduced this from the keys. Jim had the only set of keys to a storage container for the family sports equipment. The day before that last hospital admission, a frigid Saturday, he had been supervising our son, showing him how to navigate with and secure the equipment. Until only hours later that very night, he had been convinced he would be well enough to go skiing with our children the next day. He had ten days left. By Saturday night he knew he would not be well enough to travel. By Sunday night he must have known he would not need any of these things in his pocket again, although he had carried them through three previous hospitalizations. He had given me his wallet two hospitalizations earlier. Along with the keys, he had left behind his medical insurance card, a cobalt blue hospital card, and a sky-blue card with no markings. I knew that embedded in the credit-card-sized piece of plastic were the coordinates by which radiation had been vectored towards his pancreatic tumor for seven weeks. And he had carried a penny. This was not just any penny, and not even easily recognizable as a coin. It had been flattened and stretched out in a jagged thin sheath in the summer of 1977, on railroad tracks by St. Froid Lake in far northern Maine. Soon after Jim began treatment, his friend Gerard came to visit him. Before he left, Gerard gave the penny to Jim. Gerard had kept it all those years, a memento of a high school summer trip they had made to Eagle Lake with another friend, Joe. I looked at Jim when Gerard handed him the penny. It was as if I could see through Jim’s eyes, as he looked at it and touched it, scenes he had described to me over the years about that trip with enduring friends: seeing the Northern Lights for the first time, getting perilously close to a moose wading by the shores as they navigated in a canoe, turning around the nun statue in the cabin’s fireplace so it faced away from them (lest she be offended by witnessing the debauchery of three high school boys drinking beer), putting a penny on the nearby train tracks. Jim took me and all our children to this same place for several summers so we could picture it, too. He took us out on the lake, coaxed us all both to canoe slowly and to be pulled in a heart-pumping rush on tubes behind a speeding boat. He sprinted with the children to get bright kites aloft, and introduced us to culinary atrocities like rubber donuts and hot dogs with the color and sheen of a scarlet candy apple. He pointed out birds by species. He showed us insects and plants, and waded where the children gathered clouds of tiny silver fish in buckets of green water and then released them in a rush. He plucked a lake leech from our toddler daughter’s plump toe and convinced her that she should not let that first taste of the lake deter her from sampling its treasures. I realized that just as Jim’s wedding ring is a talisman for me now, something I touch every day and which transports me, Jim must have kept this penny in his pocket through the months as he endured treatment and his symptoms worsened. By holding its smooth sides between his fingers he could have heard the lake water lapping and Gerard’s and Joe’s hearty laughs. I can, too. He would have been reminded of lifelong friendships, of wonder at nature, of youthful adventure and risk, of firsts rather than lasts. He knew I would want to hold on to the penny. This entry was posted in Love and Loss and tagged Eagle Lake, friendship, northern maine, penny, talisman. Bookmark the permalink. 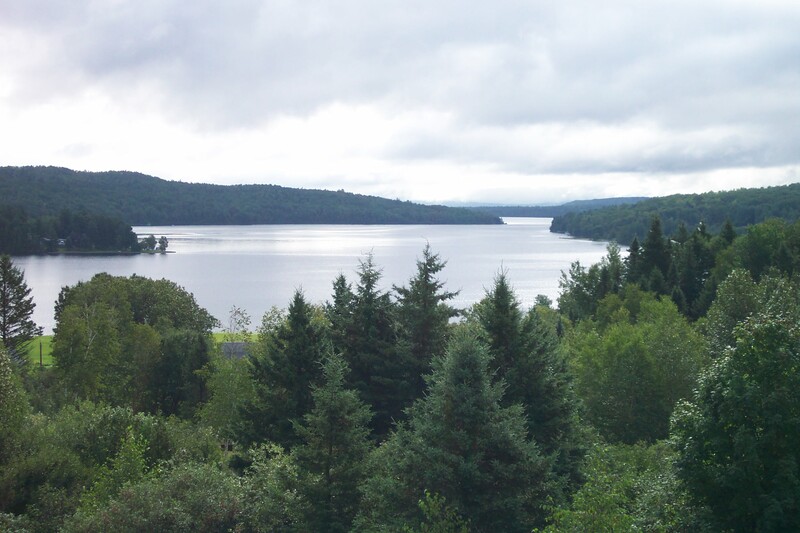 Images of the lake in Northern Maine bring peace to me as well. I remember putting pennies on those railroad tracks as a little girl, but I don’t know where my pennies went. It makes me happy to think that Jim found peace in recalling his time in Winterville. It is an important part of our shared history, certainly. Thanks for sharing this, Steph. As I watch the snow fall this morning, far from railroad tracks and Northern Lights, I can see Jim’s face, hear the jangle of keys, feel the brittleness of the penny. Through your words, it’s as if he’s here. Thank you. I remember them going on that trip – it was “so wild!” (wink!) Really, there is not too much to do up there except kayak, sail, flatten pennies, and drink beer. Those wild and crazy guys had such a good time, and it is so nice that Jim kept that penny to remember that trip. Stephanie – you are doing a wonderful job with this blog – not only are your entries beautifully written, but they are from a deep place in your heart and that makes them truly genuine and important. I can visualize Jim nodding, and quietly smiling, and happy you are doing this. I agree with Denise. When you go this deeply, when you are willing to go this deeply, you strike the Universal Chord and speak Truth to all of us. You enlarge us. You offer healing to us. I pray the same for you. This is beautiful. Brought me to tears! Thank you for sharing him, and your heart, with us. Thank you for reading, Karen.